Scottsdale has been called the “World’s Finest Golf Destination,” and with more than 200 courses in the city and surrounding area it’s easy to see why. But the Scottsdale golf experience extends well beyond our championship tracks to professional sports, state-of-the-art casinos, top-notch dining and a vibrant nightlife scene. Scottsdale’s desert courses combine rugged natural landscapes, strategic bunkering and manicured island greens for a challenge unlike any other. Local desert-style favorites include Troon North Golf Club, Boulders Club, TPC Scottsdale and Grayhawk Golf Club. If your likings lean toward tree-lined fairways, acres of green grass and sparkling water features, try one of our traditional layouts like McCormick Ranch Golf Club, Gainey Ranch Golf Club, Camelback Golf Club or Talking Stick Golf Club. Pressed for time? Check out the 18-hole, all-par-3 Short Course at Mountain Shadows. It’s a singular experience that challenges better players while also being fun for more casual golfers. Best of all, it only takes about two hours to play. Want to shave a few strokes off your game? Consider a set of custom clubs. Cool Clubs uses the latest technology to analyze your swing and design a set of clubs fitted to your exact specifications. Using the right equipment is the fastest way to a better game! Massage at the Fairmont Scottsdale Princess’ Well & Being Spa for heat-driven muscle repair or the Golfer’s Massage at the Spa at Four Seasons Resort Scottsdale for extra relaxation and stretching. For off-the-course entertainment, bring your best game face to Arizona’s largest poker room at Talking Stick Resort Casino. Grab a pitcher of locally brewed beer and hit some balls at the high-tech wonder that is Topgolf Scottsdale. Or follow the Old Town Scottsdale Ale Trail or Wine Trail and sample some of the city’s finest craft brews and Arizona wines (download both maps at ExperienceScottsdale.com). The Scottsdale area is home to teams from all the major sports leagues, including the NFL’s Arizona Cardinals, NBA’s Phoenix Suns, MLB’s Arizona Diamondbacks and NHL’s Arizona Coyotes. And if you’re here in March, don’t pass up the chance to take in a Cactus League Spring Training game at Scottsdale Stadium, home of the San Francisco Giants. Tally the scorecards and settle the day’s bets over a great meal. For melt-in-your-mouth barbecue ribs and an unparalleled collection of sports memorabilia, head to Old Town’s Don & Charlie’s. Want to spice it up? Try the modern Latin cuisine at The Mission. Or for the ultimate steak-out splurge, book a table at Dominick’s Steakhouse or Mastro’s City Hall Steakhouse. If you still have energy to burn after dinner, Old Town Scottsdale is the place to be. Nearly 100 bars, lounges and nightclubs keep the party going until the wee hours. Three to try: Rusty Spur Saloon, El Hefe Supermacho Taqueria and Dierks Bentley’s Whiskey Row. 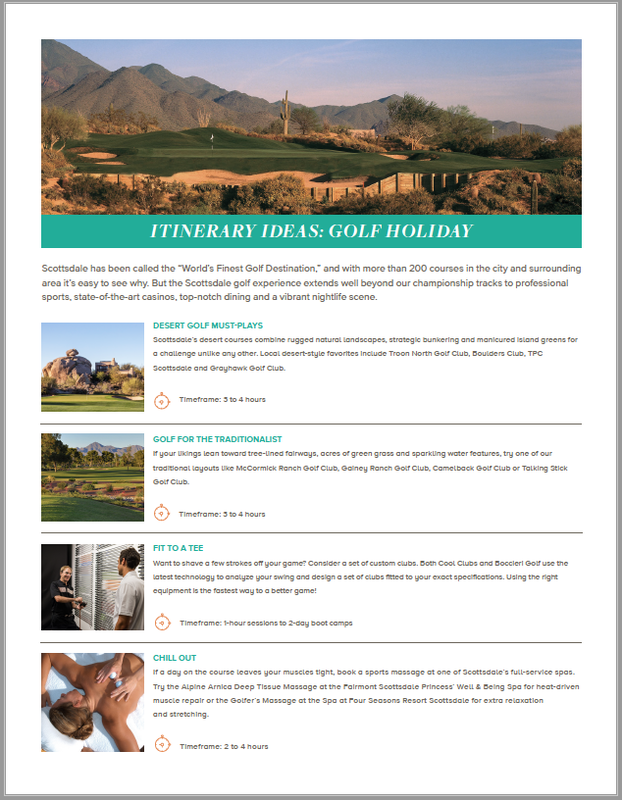 For more information on these and other Scottsdale adventures, contact our destination experts at toursim@experiencescottsdale.com.